“Scores do not reveal the most important facts about a wine. The written commentary (tasting notes) that accompanies the ratings is a better source of information than any score regarding the wine’s style and personality, its quality level relative to its peers, and its relative value and aging potential.” – Robert M. Parker, Jr. Unless you’re a lobster fisherman off the coast of New England, I understand why you haven’t filled your wine racks with bottles of buttery Chardonnay. While such wines go well with chunks of lobster dipped in butter, they’re a bit much for other things, and you’re probably not eating lobster every day. And, as things go to the challenge and sometimes frustration of winemakers, pendulums swing and the publics’ preference for Chardonnay turned toward steel: fresh, fruity, crisp, and acidic. But in that effort to meet a changing public demand, I've been exposed to Chardonnays so acidic, they seemed to threaten the enamel of my teeth. Can we, in the U.S. just settle in? France did so years ago with Mersaults and White Burgundies, Mercury and Pouilly-Fuisse (all made from the Chardonnay grape). But in the U.S. while we continue to label bottles with names of grapes (instead of regions) it’s sometimes anyone’s guess what style is inside the bottle. Then again, maybe that’s what makes for surprise and the joy of discovery. 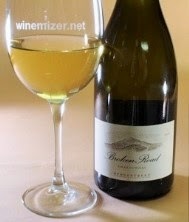 I recently had such a joyous experience tasting again a bottle of Stonestreet’s “Broken Road” Chardonnay and it has put the fun back into wine tasting. I’m perfectly happy, mind you, enjoying a Chassagne or Puligny-Montrachet on a beautiful day sitting by the beach. It never disappoints. It’s always delicious. But it never surprises anymore. After so many decades of tasting wine, the pleasure remains but the thrill is gone. In fact, while enjoying many wines for review this year, few –though all pleasurable – thrilled me. “Broken Road” thrilled me to the extent that even remembering the tasting still excites. This wine is unique enough to make descriptions almost nonsensical. To begin, the nose of this Alexander Valley AVA Chardonnay offers soft oak but also tangerine, honeysuckle and tropical fruit. And here’s where it get nonsensical: it hints – doesn’t confuse with, but hints – just a soft whisper – at Gewürztraminer! No, you won’t confuse the two, and trust me, the experience is delightful. The spice and tropical fruit aromas of this wine are a delicate ballet of balance. In music, these would be grace notes. And these same suggestions carry into the taste, but again as a most delicate hint. There’s no confusing the two grapes. There’s subtle butterscotch and caramel from well-handled Chardonnay, but it’s the orange zest that excites and surprises the palette. There’s also peach. But still, nothing overwhelms. The orange zest is evident, but plays as an important instrument along in a symphony of flavors. With all this going on, all this freshness, the wine’s mouth feel is creamy and evidences that balance is not just in the aromatics and flavors but also in the wine’s texture. Yes, this is a Chardonnay that is oaked but so deftly handled that an abundance of fruit is evident, not obstructed. To Stonestreet’s credit (and certainly the winemaker’s) the fruit, I think, is improved through its delicate malo-marriage in wood. The wine is clean, crisp and with fruit evident yet creamy and lush in the mouth. I tasted this wine again on the second day. With the small remainder, another hint toward citrus, now Meyer lemon, but again – reserved, enticing, not clubbing the senses. It finished with a nice (take that to mean balanced) oaky, but zesty citrus/orange/Meyer lemon in a long, palette-cleansing finish. It is not possible for retail outlets to carry every wine produced, so if your retailer does not stock or cannot order this wine, I’ve included information below for contacting / visiting the tasting room and winery. 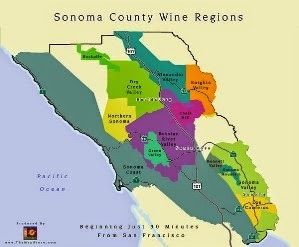 If that serves as a reason for a vacation trip to Sonoma, all the better. 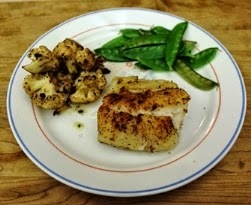 But if you prefer to take an armchair vacation and enjoy pairing wine with a meal at home, seafood is a natural. Mussels and shrimp? Great. Any cheese based or béchamel enriched pasta dish would benefit from the wine’s cleansing acidity. Enjoy a glass of wine, look through your recipe collection and let your imagination begin. Respecting what Robert Parker, Jr. said concerning written commentary, I’m sure my commentary is inadequate. It’s so because rarely does a wine so excite me that describing it requires stepping so far outside the cliché box as to risk embarrassment. So let me point out that Mr. Parker awarded this wine 93 points. Stephen Tanzer wasn’t far away with 92 points. And perhaps once a year, and even less frequently than that, I award a “4 Glasses” rating to any wine. But Stonestreet’s “Broken Road” Chardonnay deserves it. I brought this wine to a holiday dinner party and will pass along that it was acclaimed by everyone at the table. So forgetting the experts and the somewhat experts (like me) it seems this chardonnay has a lot of appeal and shouldn’t be missed. OK for all the wine geeks out there, (and those that want to learn the jargon) following are the “Tech Specs” that some like so much. Reading them should give you a clue as to how this wine offers such fresh fruit while maintaining a creaminess. Follow Wine Mizer on Face Book for mini reviews of wine, recipes, fun facts and more. Fermentation Primary fermentation in barrel, followed by 100% malolactic in barrel. Native yeasts. Lees stirred monthly.